What Are Chlorine Generators and Salt-Water Pools? It can be complicated deciding which pool is best for your family. Many questions revolve around salt-water pools or chlorine free pools. Salt-water pools are NOT chlorine free pools. A salt-water pool is simply one that utilizes a chlorine generator. Chlorine generators have been around for decades, and as technology and materials continue to evolve, they continue to improve in performance. Ocean water has a salt content of around 35,000 parts per million ("ppm"). Humans have a salt taste threshold of around 3,500 ppm. 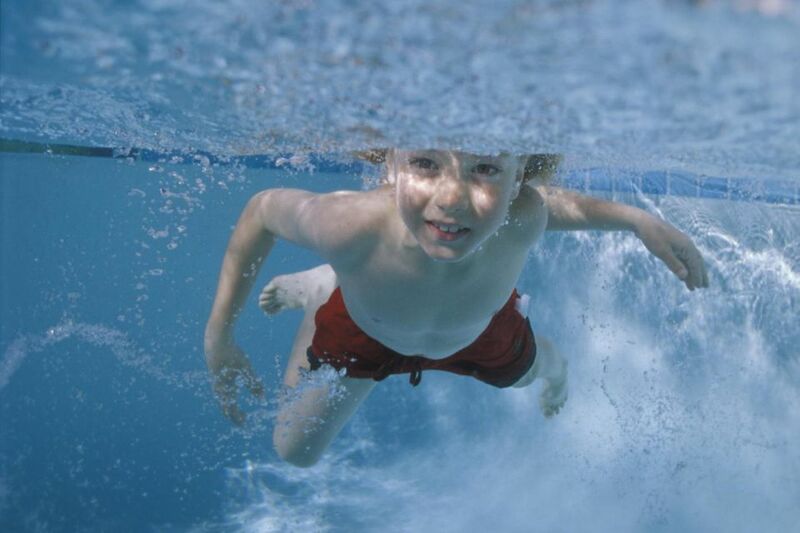 Most chlorine generators require a salt content of 2500 to 6000 ppm in the pool. A unit that needs less than 3500 ppm to operate effectively is optimal. If the salt content is higher, that warm, salty water will be pretty distasteful! Swimming in a mild saline solution is much like taking a shower in soft water. Generally, when people swim in a non-chlorine generator pool (a pool with no salt water in it) they feel like their skin dries quicker upon exiting the pool. They may feel and/or see a whitish residual, chlorine flaking, on the skin. In a salt-water pool (one with a chlorine generator) the water feels smooth, your skin feels smooth and many people feel more refreshed. What Does a Chlorine Generator Do? It's main function is to produce chlorine for the pool so you do not have to buy it, store it or handle it. These are big advantages for many pool owners. Chlorine generators, when functioning correctly, produce chlorine constantly (when the pump is running) with most units. This keeps a residual of chlorine in the pool that prevents algae from growing. The secret is keeping the cell free of calcium and mineral deposits--the cell itself is made up of precious metals-it must be maintained so it can continue to make chlorine. Through the process of electrolysis, water passing over the chlorine generator cell produces chlorine that is instantaneously transformed into Hypochlorous acid. When any type of chlorine is added to water it all makes the same thing: Hypochlorous acid. It does not matter if it is Sodium Hypochlorite (liquid chlorine), Tri-chlor and Di-chlor or Lithium based, Cal-hypo or even gas chlorine--it all makes Hypochlorous acid. Hypochlorous acid is the active sanitizer; this is what kills algae and other harmful stuff in the water. Its effectiveness is totally predicated on balanced water conditions and, more importantly, proper pH. So, with a salt water system, you still must maintain your water balance (pool chemistry) properly. As long as you do this, a chlorine generator is a good choice. There are two types in use today on residential pools. The first one is a brine unit. This unit does not require the pool to have salt added to it. A tank or chamber at the pool equipment area has a predetermined amount of salt in it. Through electrolysis, chlorine is produced and immediately injected into the pool circulation system. These units are messy and produce by-products that are not simple to dispose of. These are the less common of the two types. The recommended unit is the type requiring that salt be added to the pool. There are two types of these units. One has the chlorine-producing cell and the electronics installed at the equipment while the other has the cell installed in the deck near the pool with the electronics usually located at the equipment. The deck unit works on the principle of convection. It makes chlorine even if the pump is off while the other more common unit makes chlorine as water is passed through the cell with the circulation system (pool pump on.) In both cases the cell must remain free of mineral deposits or it will not work properly. There are non-reverse polarity units and reverse polarity units. A reverse polarity unit reverses the electron flow through the cell causing mineral deposits to flake off. In some instances the now larger particles will get caught in the filtration system. So the claim that the units help keep calcium scum off the tile is partially correct. These cells do not require as much cleaning. (Don't believe a claim that a unit doesn't ever need to be cleaned.) A reverse polarity unit will cost nominally more than a non-reverse unit. Chlorine generators can help fight against waterline scum build-up. They create a better, healthier swimming experience for most people. It isn't necessary to handle or buy chlorine, and, if the unit is functioning correctly, chlorine residual will always be present in the pool, eliminating algae. This makes it nearly impossible to get burning red eyes from chloramines, which is usually the culprit. Even with a chlorine generator, you still must maintain your pool. You still must maintain correct water balance, and you must maintain the unit itself. The best pool will have 24/7 circulation, correct hydraulic design with an in-floor cleaning system for bottom up cleaning and circulation, a quality ozone system, and a chlorine generator for sanitizer residual. You can expect to pay at least $1,000 and up to several thousand dollars, for a quality chlorine generator unit. DISCLAIMER: If you do not maintain a chlorine generator or maintain your pool chemistry you can destroy your pool's interior finish, decking and pool equipment. Salt-water pools are great but they need care. You now have the recipe for a low maintenance pool. Enjoy, and swim safe! Median vs. Average: What's the Difference? Who or What Is Kokopelli? What is a Microburst? It Really Isn't a Tornado. What Does It Cost to Own and Maintain a Pool in Phoenix?